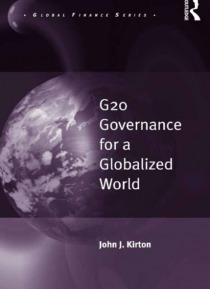 This book offers the most thorough, detailed inside story of the preparation, negotiation, performance, and achievements of G20 gatherings from their start at the finance level in 1999 through their rise to become leader-level summits in response to the great global financial crisis in 2008. Follow the moves of America's George Bush and Barack Obama, Britain's Gordon Brown and David Cameron, Canad… a's Stephen Harper, Germany's Angela Merkel, and other key leaders as they struggle to contain the worst global recession since the Great Depression of the 1930s. This book provides a full chapter-long account of each of the first four G20 summits from Washington to Toronto with summaries of the ensuing summits. It uses international relations theory to build and apply a model of systemic hub governance to back its central claim to show convincingly that G20 performance has grown to successfully govern an increasingly interconnected, complex, crisis-ridden, globalized twenty-first century world.